This October, God of War die hards will be able to get their hands on the United Cutlery replica Blades of Chaos and the first of six issues of the new comic series from DC Comics. Then, this March, the first of two God of War Novels arrive from Del Rey. Sounds like someone went a little marketing crazy. Here's the break down of the books, the comics and, yes, that fancy set of knives. God of War Comic Book Series (October 2009): Published by DC/Wildstorm Comics, the series will be written by Marv Wolfman (The New Teen Titans, Crisis on Infinite Earths). The six-issue series will be released on a monthly schedule, leading into the March 2010 release of God of War III for the Playstation 3. United Cutlery's Blades of Chaos (October 2009): United Cutlery , manufacturer of licensed edged and adult collectibles for the entertainment industry since 1981, will create a scaled replica of Kratos Blades of Chaos. The weapon will be a total of 20-13/16 inches long and have a 12 7/16-inch blade constructed from solid-cast zinc aluminum with a custom-etched mold texture, and unique fantasy grindings that mirror the piece used in the game. The handle grip is injection-molded and surrounded by an intricate, detailed cast-metal guard and pommel. 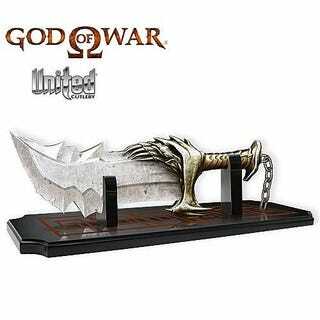 The Blades of Chaos replica includes a custom display stand with the God of War logo. Del Rey Books' God of War Novels (March 2010): Del Rey will publish two novels based on the God of War series. The first novel, God of War, will be written by author Matthew Stover. In the novel God of War, Kratos, the game's protagonist, is a great warrior who seeks revenge on the God of War Ares for the deaths of his wife and child. On his journey to Olympus, Kratos must battle great monsters of legend—and fight his own inner demons. Kratos' quest will take him through a world of Greek mythology transformed, in which the familiar legends take on a terrifying new life—from the Aegean, where Kratos will grapple with the Great Hydra, to the depths of Hades, where Kratos will face death itself, to the heights of Mount Olympus.